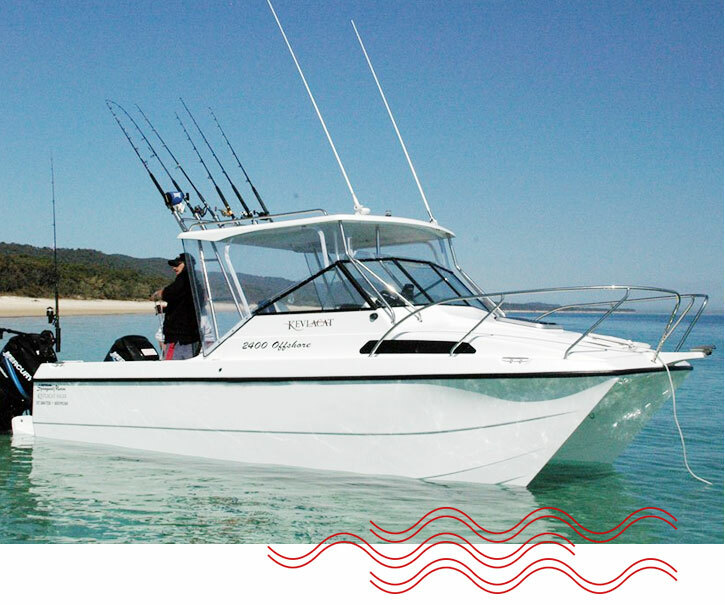 Based on the ever-popular 6.2m model, KEVLACAT designed the 6.5 metre Offshore Series 2400 to meet the needs of the serious sports fisherman, with a drier and softer ride. With the fuel capacity and sea-keeping ability to venture far offshore while still being trailerable, the 6.5m opens up endless opportunities for the travelling angler. The all new 6.5m is designed to meet your requirements and more. 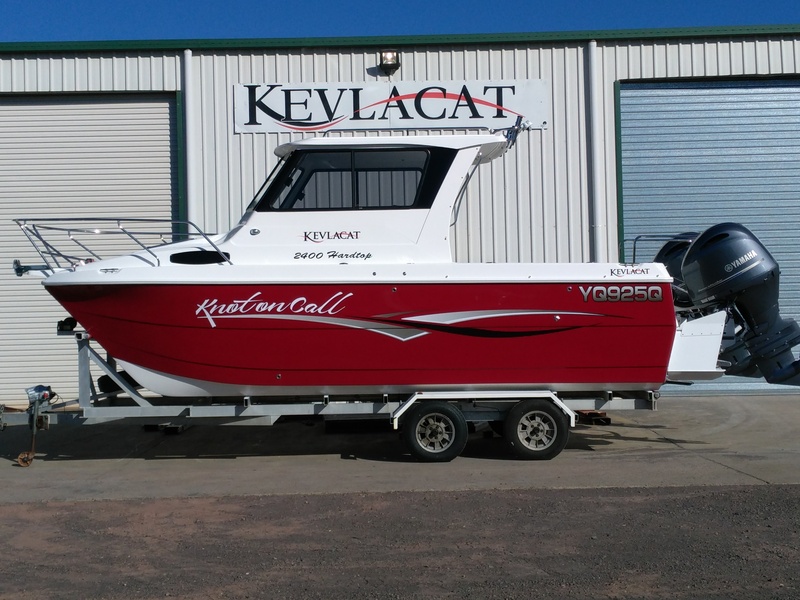 To build the ultimate power boat for fishing in deep water, KEVLACAT’s design and construction (that includes bulkheads hull to hull) utilises Kevlar Cloth between layers of fibreglass. We use Kevlar exclusively in ALL hulls and at KEVLACAT with vinylester resins. 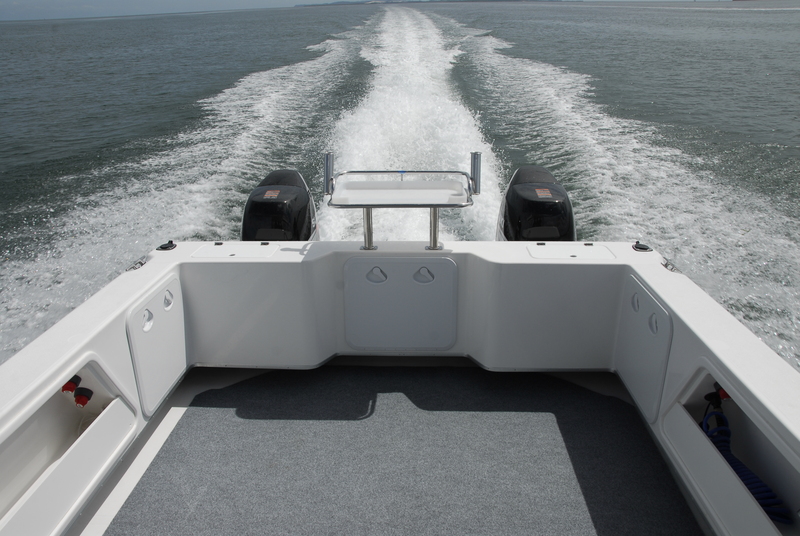 Our symmetric hull design ensures that your KEVLACAT provides you with a safe, comfortable ride in the most demanding sea conditions. We combine our advanced hull design with the latest electronics, engines and monitoring tools for the most enjoyable boating experience. 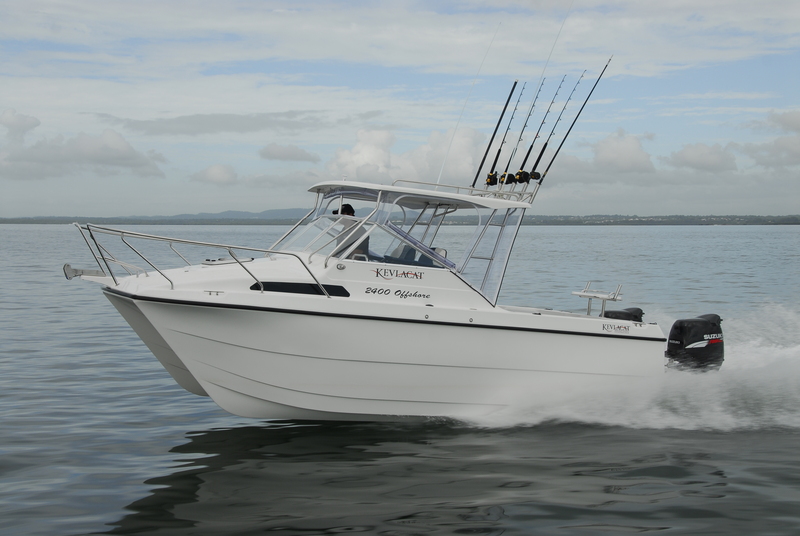 If you’re looking for a substantial fishing platform built with space-age materials, the KEVLACAT Series 2400 is the boat for you! 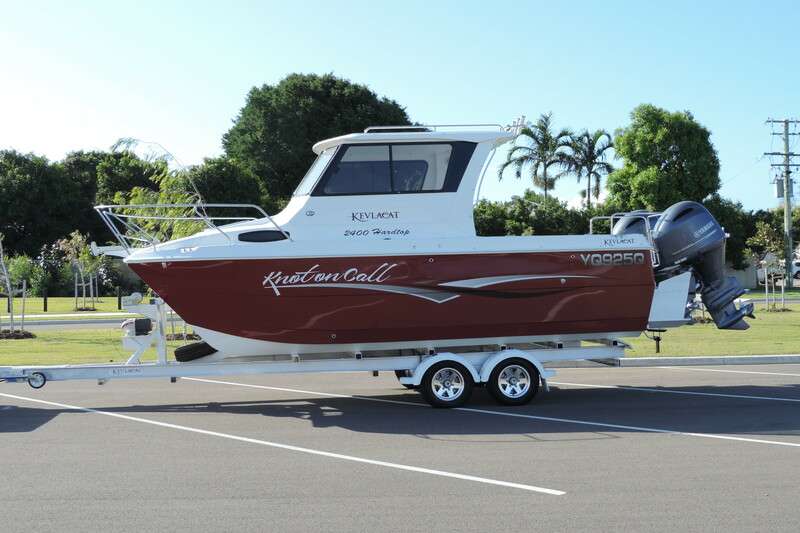 Trailering is a breeze, the KEVLACAT package includes a custom built trailer designed to minimise hassles at the boat ramp. Full drive-on, drive-off capability make short handed trips a real alternative. Power boosted disc brakes on all four wheels, ‘Alko’ independent suspension and water proof wheel bearings are all standard. The KEVLACAT 6.5 metre Series 2400 Offshore was released in January 1998 and has hit the ground running! The 6.5 metre Series 2400 has now replaced the ever popular 6.2 metre series 2300 with a longer length and a new deck concept featuring a larger cabin. The 6.5 metre is easily trailered with a 4WD. 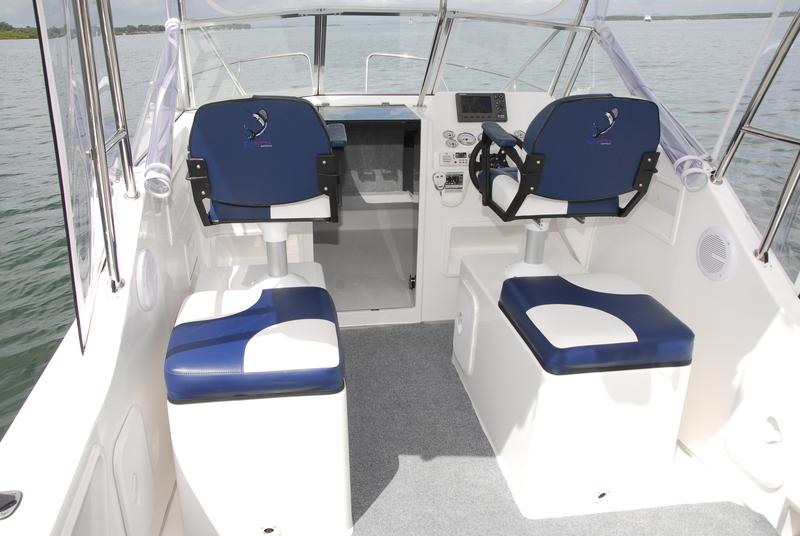 The standard features of the 6.5 include two large seat pedestals, one as a full length ice box and the other side is half an ice box and storage, fitted with Relax seats, plus extra seating for two. Every aspect of the new 6.5 has been carefully thought out and many hours of research and development has made the 6.5 what it is today. The 6.5 metre is available in a soft top version or a hardtop version. 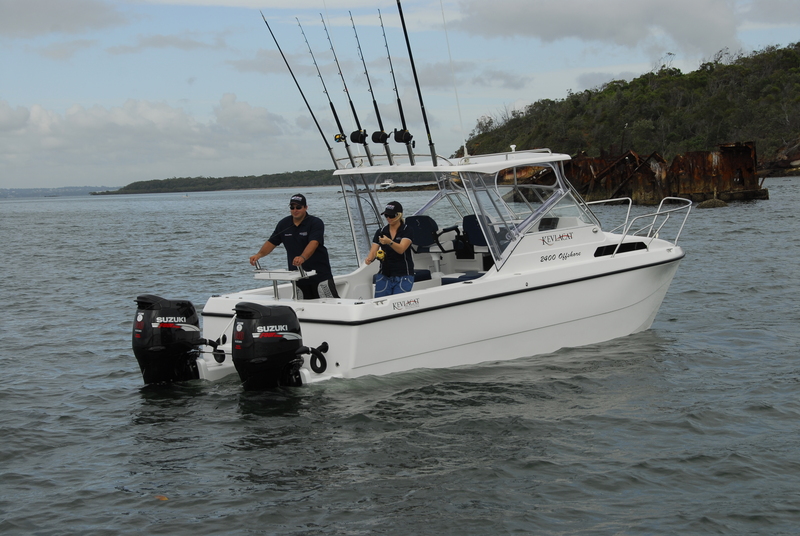 This model is more than capable of handling the new four stroke outboards and is best suited with a pair of 115HP out board motors. This vessel is also available in Survey and is the best offshore fishing vessel in her class.